Me & my running buddy for this race, Jess. This is Part 2 of Candace’s race review and recap. You can check out Part 1 of her review now, its ok, we’ll wait for you to read it and come back! 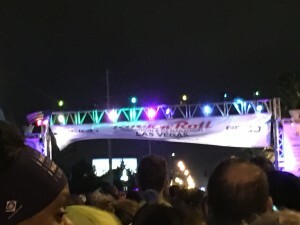 The race started in front of the Las Vegas airport in a mist of rain that would eventually turn into a downpour for the first 3 miles. From there we ran a mile down toward the “Welcome to Las Vegas” sign before looping onto the other side of the street and heading toward the main strip. In this stretch a DJ was placed in a way that we got to hear the music both on the way down and back. Once we looped around we now had the wind at our backs, so it was less noticeable than it had been. The starting line showing the effects of the blowing winds. Mile 2 put us right in front of Mandalay Bay. 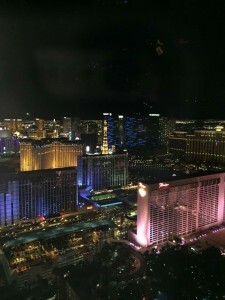 Now, being someone who comes to Vegas quite often I always wondered how far it is from Mandalay Bay to the Stratosphere…I realized that I was about to find out (spoiler alert: it IS far!). In between miles 2 and 3 a band was set up, but unfortunately due to the rain, they were not able to play. In this section we also saw where people could get married while running the race. It was fun to spot all the bride & groom running costumes along the course and getting to congratulate them. At some point before Bellagio we went over a timing mat and we were confused because we never saw the 3 mile or 5K signs, but looking back we realized it was the 5K timing mat because the next mile marker we could see was mile 4. At the Bellagio we crossed over to the other side of the street, which put us in front of Planet Hollywood. At this point the rain had started to clear up and I began to get warmer and was no longer regretting my decision to wear a tank top. From the time we crossed the street until we got down past the Mirage there was so much crowd support and entertainment! We were having so much fun we completely missed the 5 mile marker and next thing we knew we were at mile 6 and coming up to the Stratosphere. Now it was time to head down to Old Vegas. 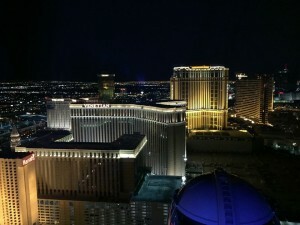 I was pretty excited for that because I had never seen Old Vegas at night. We passed multiple wedding chapels along the way and it seemed like we were headed right for Freemont Street, however they took us on a loop to the right to get an extra mile in before we could enjoy Freemont Street. This loop was probably my least favorite part of the course. It was very dark and there was not a lot to look at, except law and bail bonds offices. Around mile 9 we were finally on our way onto Freemont Street. Their lights did not disappoint, and neither did the entertainment. We came out of Freemont Street around mile 10 and it was time to make our way back toward the Mirage to the finish line. Jess and I were excited at this point and kept saying “it’s just a 5K from here!” Our excitement was soon met with 45-55mph winds that prevented us from running (we literally had to slow to a walk to fight the wind) in some places and blasted sand in our eyes in others. This made our last 3 miles less than enjoyable. During these 3 miles it took longer to get water because the volunteers could not pre-fill the cups as they kept blowing over. To their credit, they tried their best to help us runners during these less than challenging conditions. Additionally, every mile marker from 10 on was almost unrecognizable from the wind damage. Finally we crossed the 20K marker and realized we only had 0.7 miles to go and the finish line party was in sight! We crossed the finish line feeling very accomplished just for finishing the final 5K! The Half Marathon & 10k Medals. Full disclosure: I am kind of a snob when it comes to SMOs and, given this, I can say this medal did not disappoint for the half! The medal is shaped like a slot machine, is outlined in a nice blue finish, it actually spins, AND it glows in the dark! The size is also up to par compared to other half marathons. The full marathon finishers received the same medal design, though it was bigger and colored purple instead of blue. My friend Kari ran the 10K and her medal did not disappoint either. 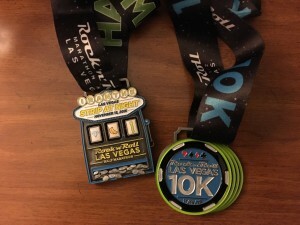 The 10k medal was shaped like a stack of poker chips and had 10K written on the front one (it also glowed in the dark). Rock ’N’ Roll definitely gets an A+ in my books for the medals this race weekend. With strong winds blowing throughout the race, a lot of the post-race experience had been modified or even destroyed, so we did not get to enjoy much of the after party that Rock ’N’ Roll races tend to stage. We were in a hurry just to get out and make it back to our hotel for a HOT shower. Unfortunately the post-race area was laid out in a way that forced us to walk another mile just to get to the exit. However, as luck would have it, the exit ended up being right in front of my hotel! We were able to gather all the race goodies along the way: SMO, mylar, water, Gatorade, chocolate milk, bananas, pea chips, pretzels, power bars, Craisins, and beer. I definitely could have used a bag to gather everything along the way! Seeing as my race was cut short the previous weekend at the runDisney Wine and Dine Half (Half) Marathon (full race review coming soon!) I did not get to use the entirety of the playlist I had made from the week before so I decided to use it again. My friend Jess ran with me for the entire race so I found myself ignoring most of my music and instead talking to her. I actually could have gone without music all together with all the live music and DJs along the course. Plus with the last 3 miles being in strong wind I could not hear my music anyway. The number one change I would have made for this race would have been to dress warmer. You can always take off layers mid-race, but you cannot add to them. I would absolutely run this race again! 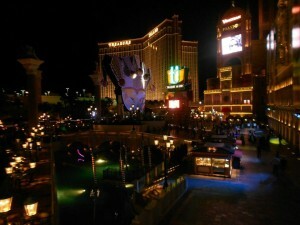 The strip is absolutely gorgeous at night and there was something to entertain along every bit of the course. I even met some people along the course who had run runDisney’s Avengers Half Marathon (editor’s note: we will have full coverage of that event coming soon!) 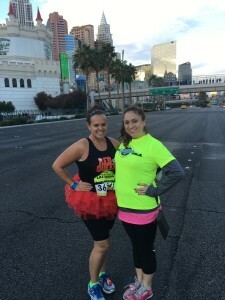 that morning and then hurried and got to Las Vegas to run the half that night…this got me thinking about a potential a future runcation/race challenge? Maybe…. This is Part 2 of Candace’s race review and recap. If you missed Part 1, be sure to check it out, we promise that everything you read will make even more sense, you know, proper context and all!